Old Ridgefield: Are deer down? Connecticut’ deer population has been stabilizing, maybe even declining. So says the Wildlife Division of the Connecticut Department of Environmental, which in February completed its latest aerial population survey. Officials put many qualifiers on their numbers, including the fact that the aerial survey looks at only one percent of the state’s total deer habitat. 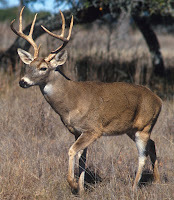 Nonetheless, from 1993 to 2003, the estimated winter deer population rose from 49,472 to 75,771. Last winter, the estimate was 62,163. If the state’s system of surveying is reasonably accurate, that would be a noteworthy decline. We are still in the most deer dense part of the state. Fairfield County has an estimated 29.4 deer per square mile, the highest density of any of the 12 state zones. The statewide average is 17. Wildlife officials also watch data on hunter kills, deer-vehicle collisions, and even “homeowner concerns,” and all also seem to indicate the population is at least stabilizing. In a word, the state seems to be saying, hunting.